While all these actions are steps in the right direction, this school year we decided to be even more intentional about encouraging our students and staff to read more diversely. By introducing the Raptor Reading Bingo challenge, we have taken our focus on social justice and multicultural literacies to the next level. 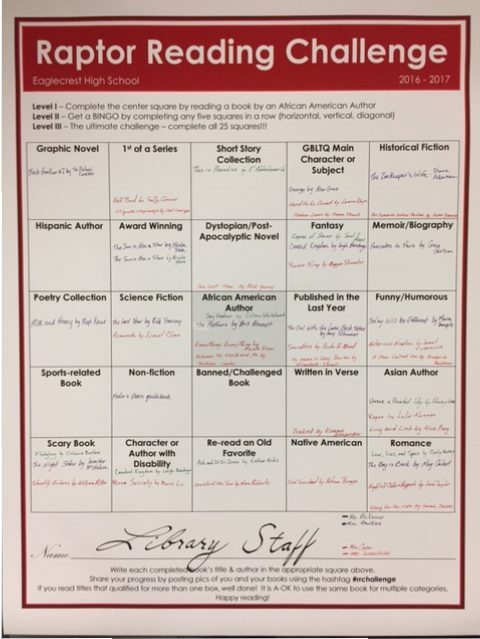 We created a bingo board that gives students and staff choice in their readings, but is designed to get them to read books by authors of color and featuring other under-represented groups like LGBTQ. As part of introducing this initiative to students and staff, we have asked all faculty to prominently display their in-progress bingo boards in classrooms, and staff without traditional classrooms, like deans, counselors, and administration, received poster-sized versions that the entire department can contribute to. It has been especially rewarding to hear about teachers asking students for book recommendations that would qualify for a particular square, and the resulting conversations that invite discussion of race and equity within the context of pleasure reading. As the year progresses, we will continue to promote the Raptor Reading Bingo Challenge within our school by inviting students and staff to share what books they’ve been reading on our giant bingo board (pictured), and we also plan to promote it to the parents and feeder area schools in our community. 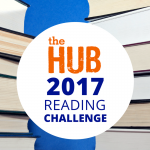 We believe there are intrinsic rewards to reading initiatives like this, and we also know that some prizes and extra credit options never hurt. Beginning next semester, we will enter the names of students who complete a bingo into a monthly drawing. The confirming of these books is usually done in a brief conversation with teachers or librarians, and we’re hoping that as the program develops, we can have students film quick and informal “60 Second Booktalks” that can then be posted on social media with the hashtag #rrchallenge. In a school our size, approximately 2700 students, it can be difficult to get full buy-in, but when we approached our English department about offering extra credit to students for completing a bingo, they all agreed. In addition to the value of modeling a school culture that supports and encourages potentially life-long habit of reading for pleasure, this initiative also intentionally demonstrates a value for books by people of color and other societal minorities. By emphasizing the value of these books, we invite students who are of these minority groups to experience these books as a “mirror” of their own experience, while these same books serve as a “window” into another’s experience for many others. Kristin McKeown and Hollie Hawkins are teacher librarians at Eaglecrest High School inCentennial, CO and are the recipients of the 2014 National School Library Program of the Year award from AASL. In addition to a passion for teaching educators about mindfulness through teachingbalance.com, Kristin is also trying to figure out how many fantasy books she can get to qualify for the bingo squares. 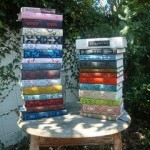 Hollie is a dedicated champion of all things YA and promotes it to teens and adults alike. I saw this over the weekend and took it to my Media Specialist (I work in a high school). She changed the Raptor/school name to ours and starting Feb. 1 it will the the challenge for the rest of this school year – for students and faculty alike. 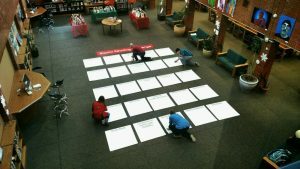 A great idea and not too overwhelming for students. Awesome, that is so great to hear!